Victoria, Australia Victoria, Australia U-Pick farms: Find a pick your own farm near you in Victoria, Australia for fruit, vegetables, pumpkins, organic foods,local produce and more! Looking for a local, pick-your-own farm in Victoria, Australia? Scroll down this page and you will see the U-Pick farms in Victoria, Australia, sorted by county. Those that offer organic or sustainably grown produce are identified by the words "organic" and/or "sustainable" in Green, next to their name (see "What does Organic mean?"). The U-pick crops they offer follow the name of the farm. To search the page for a specific crop, use Ctrl-F (or on an ipad or Mac, use their "search on this page" function) If they have a website, the name will be in blue and underlined; click on it and it will open their website. If you find anything outdated or inaccurate, see the customer and farmer menus (as appropriate) at the top menu bar to submit updates and corrections and help me keep each current! Notes for April 2019:Spring is here! Strawberries and other berries are coming in! See your area's crop availability calendar for more specific dates of upcoming crops. And see our guide to local fruit and vegetable festivals, such as tomato, corn, and more! You may noticed the new appearance to the website! Simpler, cleaner and mobile-friendly! I'm rolling it out, page by page over the next 2 months. Everything is still here; such as home canning and freezing directions. You can access it from the drop down menus at the top of the page or the site search. If you have any questions or suggestions, feel free to write me! 385 Boneo Road, Rosebud, Victoria. Phone: (03) 5988 6340. Mobile: 0418 548 958. Open: during summer every day 9-5 and most days the rest of the year; Closed Christmas Day. Also pre-picked farm fresh vegetables, seasonally available potatoes, pumpkins and sweet corn. 21-27 School Road Rawson, Erica, VIC 3825. 30 Chapman Rd, Silvan , Silvan, VIC . Phone: (03) 9737 9400. Fax: (03) 9737 9130. Email: [email protected]. Open: The farm is open 7 days a week from 9AM to 5PM from November through to April; Please note ORCHARD ENTRY CLOSES AT 4PM to ensure you have adequate picking time before close of business.Directions: about a 1 hour drive from Melbourne CBD. Self driving is the easiest option. If you prefer to take public transport, you will need to catch a train to Lilydale train station and preferably a taxi from there - call 13CABS to pick you up. We recommend also organising your return trip with the driver at the same time. For bus routes in the area please visit the Public Transport Victoria website. We offer our visitors a unique 'Pick Your Own' Fruit experience at two locations - 30 Chapman Rd, Silvan for Cherries and 27 Parker Rd, Silvan for Seasonal Berries! 7 days 9.00 am to 5.00 pm Nov to Feb (subject to fruit availability). Open Tuesday to Friday 10.00am to 4.00pm Saturday & Sunday 9.00am to 5.00pm Feb to April ( subject to fruit availability). Closed June to October but you can still purchase frozen berries by appointment. Please email your requirements! Please note: Fruit availability can vary daily due to the weather & fruit maturity. Please see our ‘Fruit Report' the night before you visit to ensure ‘U-Pick' is available. We offer our visitors a unique ‘Pick Your Own' Fruit experience at two locations to 30 Chapman Rd, Silvan for Cherries and 27 Parker Rd, Silvan for Seasonal Berries! Comments from a visitor on March 14, 2011: "Excellent"
Yarra Glen, VIC. Phone: 5962 9312. Open: from 8AM to 5PM Saturday and Sunday. Directions: Apparently the owners are in the Witness Protection Program, you must call them for their address. Farm fresh blueberries, grown in the Yarra Valley. 2018 prices were $13 per Kg! U-Pick Blueberries just 15 minutes from Yarra Glen. Bring the family and pick your own berries, as fresh as they come! 470 Queens Road (end of Cherry Lane), Wandin East, VIC 3139. Phone: 0408 805359. Email: [email protected]. Directions: Click here for a map and directions. Open: Weekends only - Saturdays & Sundays, 8 am to 5 pm from early November, then open each day during the Christmas - New Year while cherries are available. Please phone our message service to ensure Cherry Haven is open Cherries seasonally begin from early November and continue sometimes through until mid January Payment: Cherry Haven is a family-owned cherry orchard, overlooking the picturesque Yarra Valley of Victoria from the foothills of the Dandenong Ranges. Less than an hour's drive from the Melbourne CBD you will find delicious tree-ripened cherries awaiting you. Cherry Haven is perfectly situated for producing quality cherries with the added benefit of great views and a delightful countryside environment. Delicious, juicy cherries you can pick yourself. Please visit our website! Comments from a visitor on November 19, 2012: "Great fun picking cherrries under the farm nets to prevent birds from directly eating the fruits!" 1680 Stumpy Gully Road, Somerville, VIC, 3912, Australia. Phone: 61 3 5977 5822. Fax: 61 3 5977 5722. Email: [email protected]. Pick your own real Christmas tree, Mornington Peninsula, near Melbourne, Frankston, Victoria. Buy Christmas decorations. Join in family activities, hayrides, visit Santa, have a sausage sizzle. Family Fun for Everyone - close to Melbourne and Frankston! Take a Wagon Ride to pick your perfect tree. Visit Santa in the Christmas Barn and check out the decorations. Go out to the "Choose and Cut" field where you can select your own perfect tree. Take a wagon ride at weekends. We will cut it and haul it back for you. Transport is easy with our simple netting wrap, or arrange for delivery. Visit the Christmas Barn and let the kids talk to Santa, while you browse for decorations. We have a wide selection of unique decorations and Christmas tree stands to suit your needs. Help a worthy cause and enjoy a sausage sizzle run in support of the Somerville Fire Brigade on the weekends. Christmas tree varieties: Monterey Pine. This year the Christmas Tree Farm is pleased to be able to offer more options for buying your tree: Visit us and choose your ideal tree or Order a tree for delivery. Santa visits: Visit the Christmas Barn and let the kids talk to Santa while you browse for decorations. Each child receives a free gift. Bring your camera along to capture the moment. Wagon Rides: Our wagon travels the "Choose and Cut" fields, going in and out of the rows of trees; allowing you to browse for your ideal tree while entertaining the children. Get off and on anywhere on the route as often as you wish. Sausage Sizzle: Help a worthy cause and enjoy a sausage sizzle; run in support of the Somerville Fire Brigade. Monbulk-Seville Road, Wandin-East Victoria Australia, Wandin East, VIC 3139. Email us at: [email protected] .au. Directions: Take Train to Lilydale Station from Melbourne and we can pick you up from there. We are open January, November, December. Our hours are: 5 to 7 days a week 8 hour days Payment: A tent is recommended, small kitchen and shower available. Payment is per kg. 5 Sawyer St, Leongatha, VIC 3953. Phone: 03 56624801. Email: [email protected]. Open: Monday to Friday by appointment Saturday and Sundary, Open All Day. Directions: Click here for a map and directions. Logan, Young, Silvan and Boysen berries - December. Payment: Cash, only. Berries You Pick in Leongatha; 5 Sawyer St Saturday and Sunday; Open all day Monday to Friday by appointment - 5662 4801 Fresh in December AND first week of January Frozen all year round BYO Bucket or container. No entry fee. $8 per kilo - Logan, Silvan, Young and Boysenberry available. NO WORKERS REQUIRED. Extons Road, Kinglake. Tel: (03) 5786 1297. Open: January and February by appointment only; Please ring to make an appointment and check for availability of fruit before you come. Pick your own or buy freshly picked fruit in January and February. Frozen fruit packs are available all year round. High Grove Berries - blackberries, raspberries, blueberries, boysenberries, red & black currents. 227 Mt Stanley Road, Stanley, Victoria, Australia, 3747. Phone: +61 3 5728 6526. Fax: +61 3 5728 6708. Email: [email protected]. Directions: Take the Stanley road from Beechworth [8 kilometers]. As you drive through the small town of Stanley you come to a "T" intersection, here take the Mt. Stanley Road [left turn] and drive out 2.27 km. There is a large 'High Grove' sign on the left hand side of the road. Please drive very slowly on our property. Children, ducks, chooks and geese can be encountered. Open: The farm is open to the public for pick-your-own berries and cherries in December and January each year. Berries grown include blackberries, raspberries, blueberries, boysenberries, red & black currents. Each variety of fruit has its own unique season within the summer so you are advised to ring first to ensure supplies of the berry you want are available. Bring your own container or containers can be purchased on site. Facilities include kiosk selling a range of berry products, shade house, free bar-be-que, toilet. 1 Parker Road, Silvan, VIC 3795. Phone: (03) 9737 9539. Open: Wednesday to Sunday from 9:30 to 5pm for pick your own; 10am to 5pm for other sales. Directions: Corner of Monbulk-Silvan and Parker Roads, Melways 123 C1. Click here for a map and directions. Mid December to late February, depending on weather. We do not use pesticides on the crops. Payment: Cash, Visa/MasterCard. We are a blueberry and honey farm with over 15 varieties of cold-processed pure Australian honey. Free honey tastings available. Pick your own is for Adults Only, no kids under 15 years. 140 Wandin Creek Road, Wandin East, VIC, Australia 3139. Phone: (03) 5964 4451. Email: [email protected].. Open: Sunday to Friday, 9am - 5pm. Directions: in the Yarra Valley, 50 Minutes from Melbourne. Click here for a map and directions. We also offer home grown organic vegetables of the season. We predominately produce strawberries. If you would like to pick and purchase other berries we recommend that you phone in advance to ensure other berries are ready or have been harvested and are available. TTooheys Road, Pheasant Creek. 3763. Victoria. Australia. Ph: 061 3 5786 5360 Fax: 061 3 5786 564. Opening hours: Summer December -Jan. Daily 8am-6pm. Autumn March-Mid May. Daily 9 am to 5pm. Between seasons the farm is open Monday to Friday 9am to 5pm for sales of frozen berries and our range of berryfruit products. Pheasant Creek is located between halfway between Kinglake West and Kingslake Central on Main Road. At Pheasant Creek, Tooheys Rd heads off to the north-east. Along here is Victoria's largest U-pick raspberry farm which, in season, is open daily from 9.00 am to 5.00 p.m. Fresh produce is available from December to January and from March to May while frozen berries and products can be had all year round. 175 Arundel Road, Keilor, Melbourne, VIC 3036. Phone: 0418 170 335. Email: [email protected]. Open: Outside of school holidays Saturday to Sunday from 8am to 5pm During school holidays Thursday to Sunday from 8am to 5pm from start of season October through to May Also open public holidays from 8am to 5pm. Click here for current open hours, days and dates. Directions: Melways reference map 14, h2. Click here for a map and directions. We are certified organic for all crops! Payment: Cash, only. FREE Entry. Pay for what you pick. $12 per kilogram. 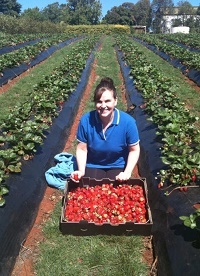 Our Strawberries are Certified Organic with Australian Certified Organic ACO Producer Number 10524A. 570 Wallington Road, Wallington, VIC 3222. Phone: 0438503993. Email: [email protected]. Open: Tuesday to Saturday 10am to 4pm November - February. Click here for current open hours, days and dates. Picking updates: Click here for picking updates. Directions: Click here for a map and directions. Strawberries October to March Apricots, Nectarines, Peaches December to January. Payment: Cash, only. Follow us on Facebook, for regular updates on what is in season, special prices and news from the farm. Pennyroyal Raspberry Farm - blackberries, boysenberries, other berries, raspberries, strawberries, potatoes, jostaberries (gooseberry/blackcurrant cross) marionberries and mulberries. 115 Division Road, Murroon via Birregurra, VIC 3242. Phone: 035-236-3238. Email: [email protected]. Directions: SW of Geelong drive to Winchelsea south to Deans Marsh follow signs from General store . We are open January, December. Our hours are: December - January 10-5 daily except Xmas day Ring for availability Tea House open for refreshments, light lunch, berry treats other fresh picks - potatoes, jostaberries (gooseberry/blackcurrant cross) marionberries, mulberries. Pure Peninsula Honey - Honey - OK, its not a pick-your-own (you'd get stung), but it seems pretty cool! "Bungower Park", 871 Derril Road, Moorooduc, VIC. Phone: (03) 5978 8413. Open: 7 days 9 am to 5.30 pm. Creamed and organic honey, honeycomb, bees' wax available. PO Box 354, Monbulk, Victoria, 3793 Australia, Dandenong, VIC 3793. Email: [email protected]. Open: 13 April 2014. Click here for current open hours, days and dates. Directions: Melways Map 122 E10 - Enter from Monbulk Rd only as Chalet Rd is no-through access. GPS will take you the wrong way! Click here for a map and directions. Payment: Cash, only. Click here for our Facebook page. Farm gate sales & U-pick (pick your own) fresh, quality, chemical-free chestnuts, as well as a range of hand made preserves, honey, chestnut flour and chestnut flour cake mixes. If U-picking, bring your own bags or containers, thick rubber gloves and be sure to wear sturdy shoes or rubber boots - no sandals or high heels please. 56 Monbulk - Seville Road, Seville, VIC 3139. Phone: 1300 36 00 56. Open: We are open every Friday, Saturday and Sunday, 10am to 5pm each November and December during the cherry season. Directions: Click here for a map and directions. Payment: Cash, Debit cards, Visa/MasterCard. 295 Mount Pleasant Road, Research, VIC 3095. Phone: 0403 316623. Email: [email protected]. Open: Call for opening hours. Directions: Click here for a map and directions.. Blueberries from middle of December to the end of January. Payment: Cash, only. $14 per kilogram. Sunny Creek Organic Fruit & Berry Farm - Raspberries (Red, Yellow, Purple, Black), Strawberries, Red & White Currents, Logan Berries, Boysenberries, Blackberries, Blueberries, Applies, Chestnuts. 69 Tudor Road, Childers, VIC 3824. Phone: +61 3 5634 7526. Email: [email protected]. Open: November to June, on Monday to Friday, from 8.00am to 6.00pm, Saturday from 8.00am to 5.00pm and Sunday from 9.00am to 5.00pm. Other times of the year open by appointment. Certified Organic Berry Farm PYO and picked berries, Fruit and Nuts, Jams and Frozen Fruit. Basic toilet/restroom facilities and small shop selling frozen berries, jams, preserves etc. Click here for a link to our Facebook page. Comments from a visitor on February 11, 2010: "Friendly staff, fun (but out of the way) place to visit." Fishers Rd, Boolarra, VIC 3869. Phone: (03) 5169 6622. Open: Call for hours. Comments from a visitor on July 28, 2009: "It's great." 1345 Leongatha Yarragon Road, Hallston, VIC 3953. Phone: (03) 5668 5268. Email: [email protected]. Directions: Travel 5km out of Leongatha along the Strezlecki highway Turn Left into Leongath Yarragon Road. Yileen Berry Farm is 15 minutes from this point. Follow Our "Berry" signs to Yileen. See you there. Click here for a map and directions. Crops are usually available in January, December. Open: 8:00am to 6:00pm or by appointment; Call (03) 5668 5268 to confirm times or berry availability. We are Open during the Christmas School Holiday Period, closed Christmas Day. We use natural practices, but are not seeking organic certification. Payment: Cash, only. boysenberries, youngberries, brambleberries, preserves and Gelato Ice Cream. 109 McIlroys Road, Red Hill, VIC. Phone: (03) 5989 2008. Open 7 days 9-5 during the season; Always ring to verify daily availability of fruit. Pick your own fruit in season, including cherries and quinces. Ellisfield Farm is the home of sour Morello cherries, highly prized for jams, pies, cakes, cordials and liqueurs. Sweet cherries from late November until early January. Morello cherries throughout January. Quinces in April and May. Blue Hills Orchard - Cherries, raspberries, strawberries, loganberries, youngberries and boysenberries. 27 Parker Road, Silvan, VIC. Phone: (03) 9737 9400. Blue Hills Orchards is nestled in the foothills of the Dandenong Ranges near the Silvan Reservoir. The Chapman family has farmed in Silvan since 1984 and are best known for their quality fresh fruit and provision of "Pick Your Own" berries. Seasonal produce. Chapman Road, 21 and 39 Parker Road, Silvan, VIC. Phone: (03) 5964 4303. Bring your own containers. Shed sales of cherries. Some berries and fruits available for picking. Raspberries, boysenberries and currants are available for your picking. Shed sales of peaches, cherries and raspberries. Chapmans do not allow berry picking on Sundays, only Mondays - Saturdays. Drouin West Fruit and Berry Farm and Berry Good Cafe - Comments from a visitor on February 11, 2010: "Hi, The Drouin West Fruit and Berry Farm and Berry Good Cafe has been closed for a number of years now. The property was purchased by a disabled-charity and then closed to the public several years ago. We used to visit several times a year, and my sister lives at Neeram so we drive past fairly often. Regards, Wolfy"
315 Fisher Road, Drouin, VIC. Phone: (03) 5628 7627. 25 acres pesticide free produce, pick your own fruit and berries. The Berry Good Cafe and Winery features over 120 varieties of Sunday ripened fruit and berries, berry train tours around the orchard, accommodation and fruit picking. Access by private transport. 185 Beenak Road, Yellingbo, VIC 3139. Phone: (0409) 024 240. Directions: Take Smiths Rd a few kilometres south of Yellingbo, to where it veers east off the Healesville-Koo Wee Rup Road. It then leads into Beenak Road, where you will find the farm. Catch or buy your own and use the barbecue facilities. The Gourmet Yabby Farm costs $3 to enter and $20 a kilogram for your catch. 235 Beenak Road, Wandin North, VIC 3139. Phone: 041-854-0445. Email: [email protected]. Open: November to January open 8am to 6pm daily including Boxing Day and New Years Day; Closed Christmas Day. Click here for current open hours, days and dates. Directions: Melway reference: 121 G3 or GPS 235 Beenak Road, Wandin North. Some GPS do not register 235, in that case use the number closet to 235 that registers, drive to Wandin and follow the hand painted cherry signs and you will find us. Click here for a map and directions. Payment: Cash, only. Click here for our Facebook page. Dandenong Ranges & Yarra Valley. tel: +61 (0)3 9756 6095. Address: 15 Blueberry Lane, Monbulk, Melbourne, VIC. AU, 3793. Pick your own blueberries (by appointment only) or purchase them just picked. 2004 prices: AUD6 a kilo or AUD8 if ready picked. Also hydroponic tomatoes (AUD3 a kilo). Frozen blueberries are available year round. Call first to assure availability of produce, particularly if the weather has been wet. The nearest train is one and a half hour drive from central Melbourne. The open hours: 9am to 5pm, Tuesday through Sunday (between Christmas and February). Comments from a visitor on December 30, 2012: "Their answer machine message says 'Blueberries are not available unless you are already on our pick-your-own contact list.'" 61-69 Prossors Lane, Red Hill, VIC 3936. Phone: 03 59892237. Email: [email protected] . Open: Cherries are ready for picking mid November through to early January; times vary depending on availability of fruit. Click here for current open hours, days and dates. Directions: Click here for a map and directions. Payment: Cash, only. Click here for our Facebook page. 52 Arkwells Lane, Red Hill, VIC 3937. Phone: (03) 5989 2578. Fax: (03) 5989 2578. Open: Dates and Times Vary, please check our website for current hours. Click here for current open hours, days and dates. Directions: Click here for a map and directions. Payment: Cash, Debit cards, Visa/MasterCard. Click here for our Facebook page. 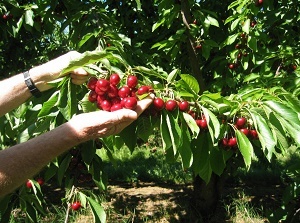 Come to our Cherry & Berry Farm situated on 24 acres of beautiful Red Hill countryside. Experience Pick-Your-Own Sweet and Sour cherries. You can also buy freshly picked Cherries, Silvanberries, Raspberries, Boysenberries, Marionberries and Blueberries. Bus bookings welcome. Crop availability: Cherries are usually available from November to the end of January. 1440 Bannockburn Shelford Road, Teesdale - (03) 5281 5449. Cafe, berry counter sales, berry picking, picnic and children's play areas, pots of flowering Liliums and home made produce available for purchase. What a wonderful way to spend a relaxing afternoon with friends, family or out of town guests! Twilight picking from Boxing Day to the end of January. ​For the most up to date information open our Facebook page We are a pick-your-own blueberry and strawberry farm, cafe and local produce market. We welcome children and their families, tourists and locals alike to enjoy the spoils that we have to offer, including a panoramic view of Port Phillip Bay. Click here for a link to our Facebook page. Pick your own blueberries available from December to March. Frozen blueberries, jam and juice are available out of season. 440 Wallington Road, Wallington, VIC. Phone: +61 3 5250 1541. Pick your own strawberries from September to May. Take Gardiner Rd north of Beenak Road. They also have organic fruit and jams. Open: January and February from Saturday to Wednesday by appointment, tel: (03) 5964 8212. Farmer's Markets, Farm Stands and Roadside Stands, Etc.